This was the first year that Dylan participated in Giving Tuesday and as you can imagine he dove right in. 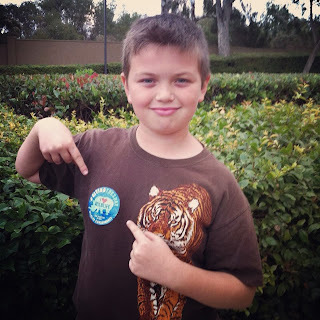 He proudly wore his San Diego Zoo Global Wildlife Conservancy Giving Tuesday sticker all day and told many of his friends at school what giving back was all about. Dylan and I had discussed ahead of time who we would be supporting on Giving Tuesday and even watched a National Geographic Google+ hangout about Causing an UpROAR for Big Cats together that evening. I watched the hangout live, but knew it was something Dylan would really enjoy too. After watching the Google+ hangout and listening to Steve Winter talk about saving the tigers and other big cats, Dylan was inspired to continue his journey of helping big cats. What started out as a dream to teach other kids about endangered animals and conservation became a reality with Dylan's Animal Adventure Camp last July. Dylan raised $300 from camp registration, which was a great start, but no where near his $1,000 goal. We have a few things in the works to continue the message of Dylan's Animal Adventure Camp and of course we will host another camp next summer, but why wait to reach his goal? After we gave $5 and $10 donations to various non-profits that we support on Giving Tuesday, Dylan had an idea. "If everyone who follows Life with Dylan on Facebook and everyone who reads this post gave just $5 to my fundraiser, then I could reach my goal of $1,000 this year instead of waiting for the next Dylan's Animal Adventure Camp in 2014." He wants to help build this new home for the leopards! Building a new home for the endangered Snow Leopard and critically endangered Amur Leopards at the San Diego Zoo is very important to Dylan. (Just as important as helping to build a new home for the tigers at the Safari Park.) Knowing how rare it is for anyone to see these animals in the wild, Dylan believes a new and improved habitat at the San Diego Zoo will help create more awareness and educate more people about these beautiful big cats. So Dylan is asking for your help to make his Christmas wish for the Leopards come true by donating $5 or $10 to his fundraiser. Thank you for supporting a child's dream to save endangered animals all around the globe. Dylan has raised $500 for the leopards. Thank you so much for helping to make his Christmas Wish come true! In his parlance, this will be a great achievement for him to unlock. Terrific goal for him. Good luck to him and the leopards!